The last couple of weeks have been pretty full-on, but our brave adventurers have decided to press on, rather than regroup. In the aftermath of the watery terrors of last week’s battle, the session started relatively slowly so that they could properly explore the dark sealed level. A magically encrypted ziggurat suggested that they would need to return with another item, while portals to and from another realm composed of elemental water, framed with broken glass, identified where all the water had come from in the first place. There were no further ways up into the interior from this level, which forced them to go back down to the main gallery, pausing only to let the dire tiger wander away. It had been attracted by all the dead bodies and had been having a quick scavenge as it passed. The adventurers decided to not engage at this time, and the tiger soon moved on. The other enormous set of stairs bypassed the sealed level, spiralling up into the darkness. Keil shapeshifted into a bird indigenous to the area and quickly scouted ahead. He saw barricades and four soldiers retreating beyond another set of doors, so hurried back down to report what he’d found. By the time they all got up there, the doors were closed, and an ambush by the Karrnathi skeletons hit them as they made their way through the narrow opening. Bumperklart took the brunt of the first wave, taking only minor wounds. A misthrown burning alchemists oil from Theodore however, effectively spammed the back of his head, prompting more than a few irate threats and barbed comments about people throwing fireworks. Past the skeletons was another large room dominated by another rune-carved ziggurat. Emerald Claw guards were waiting for them, led by a mummy sorcerer in a glowing sphere that covered most of the pyramidal structure. Spells cast by the party were nullified by the sphere before they could affect anyone inside, so it forced them to close in for a melee. 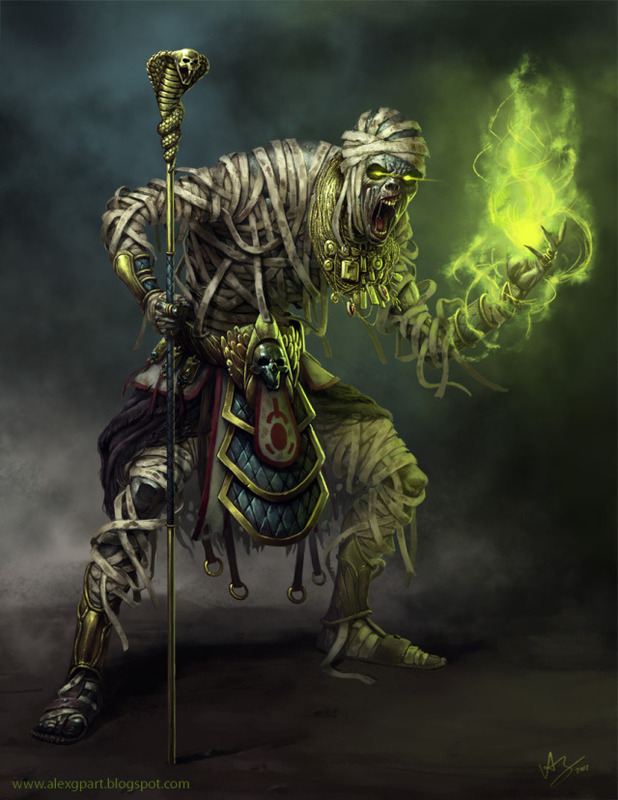 The initial clash saw the human guards dead in pretty short order, while the mummy harassed those who resisted it’s aura of dread with showers of magic missiles. We ended the session with a defiant mummy waiting for the party to press the attack.